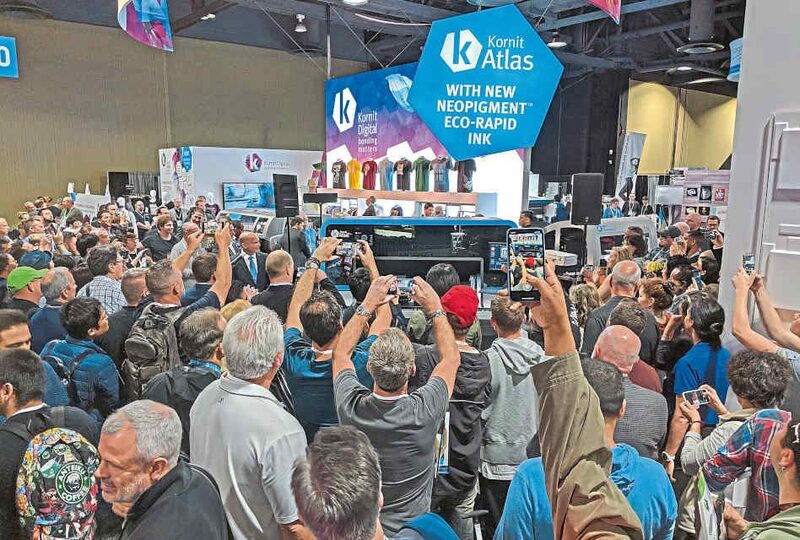 Once again, the 2019 ISS Long Beach trade show for the decorated apparel industry set the tone for the year to come. I personally walked the floor from Thursday through to Sunday, and everyone I spoke to was incredibly upbeat about this year. One major theme that ran throughout the show was the emphasis on more production and less downtime. Everywhere you looked, that aspect that was championed. Another phenomenon I noticed was that decorators who band together on Facebook groups were meeting up and roaming the aisles together. Usually, shops search and explore more or less on their own, so it was interesting to see happen. Want to make a splash? Evidently, you hide an automobile-sized printer under a black silk drape and keep people guessing as to what’s underneath. Kornit’s new printer, the Atlas, is a solution tailor-made for high-volume industrial direct-to-garment printing. As their executives delivered short speeches that few people could hear over the ever-present hum of the tradeshow floor, hundreds of cell phone cameras captured the event for posterity when the drape was pulled away. 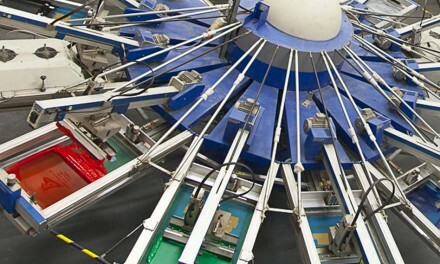 The engineers at Kornit used the collective feedback from tens of thousands of operators and the proven experience of hundreds of millions of printed garments to develop the Atlas. Designed to meet rigorous retail standards and qualifications, the advanced user interface is built to simplify maintenance and minimise downtime and the cost of ownership. The Atlas has a great redesign for what a DTG printer should look like with a large, easy-to-read interface on the left side of the front panel. Platen changes are quick as they now use magnets. There is a new fold sensor that will detect problems to prevent head strikes before they happen. The printer is twice as fast as the Avalanche and can crank out about 160 full-size garments an hour. As with all Kornits, the beauty of this printer is the pre-treatment system that is built into the process. There is a tiny player in the gigantic ink industry that is making some noise, and that is the Italian water-based ink manufacturer Virus. Using an automobile garage theme for its booth, the company built the Virus Garage Custom to demo its line of inks. 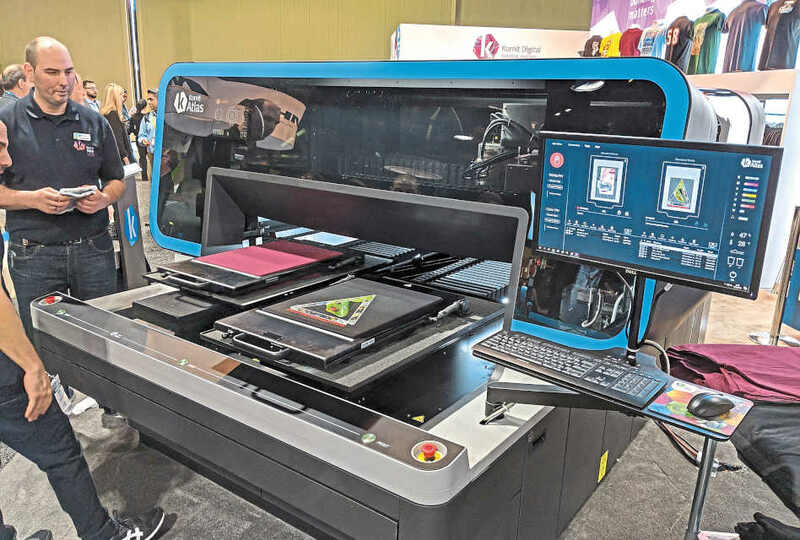 On the show floor, which by the way isn’t the best environmental conditions to be printing water-based inks, Virus set up 11 different designs, all with a different ink set, using the same press. They ran all of them in one day. This is because the clothing industry today is increasingly oriented towards fast fashion, a trend that accelerates the consumption time of textile garments, thus encouraging production models aimed at the ability to produce quickly small batches with multiple variations of style. 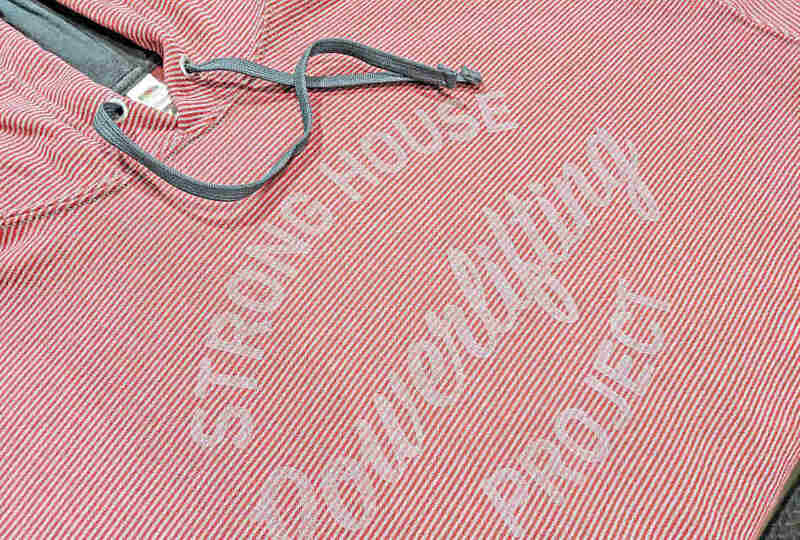 Sustainability, versatility, production speed and continuous experimentation can be sustained only through a great mastery of the screen printing technique and the use of performing water-based inks. What makes Virus different is that it has wet-on-wet technology built into its inks so you can have fantastic production results without a lot of the hassle normally associated with water-based printing. Virus is also making the process easier with its new Water-Based Mastery Course, which teaches shops that are unfamiliar with the intricacies of water- based ink printing, how to perfect printing techniques in their shop. Walking to meet someone, I stumbled upon the Smake system. It was so intriguing that I had to text my colleague to let them know I would be a few minutes late so I could fully understand what this company has developed. Have you ever wanted to integrate a fully developed, lean manufacturing workflow into your shop? Do you even know that means? Either way, it doesn’t matter because the Smake Value Production Workflow (VPM) is set up to organise your production and keep you on track. Especially if you are producing decorated apparel for an online store. 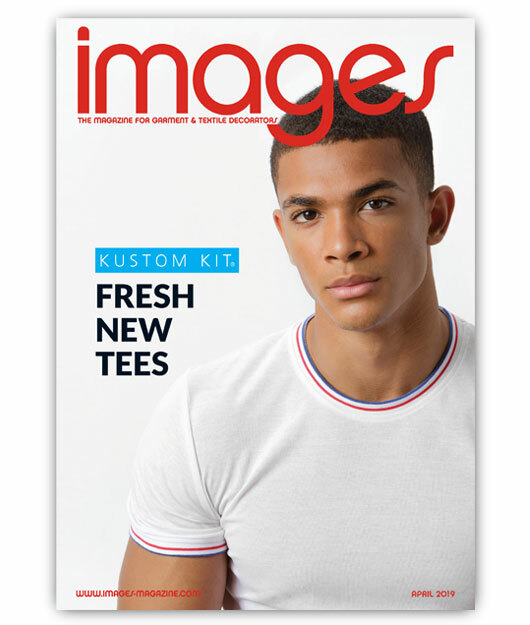 For starters, the system can project a perfectly sized image onto a loaded garment for DTG or embroidery. This means that quality placement is much easier with its system. Not sure where to hoop that left chest for embroidery? Load the shirt and the HoopMaster board moves around in any direction until you are satisfied with the placement. Then, clamp it down and you are ready to sew. 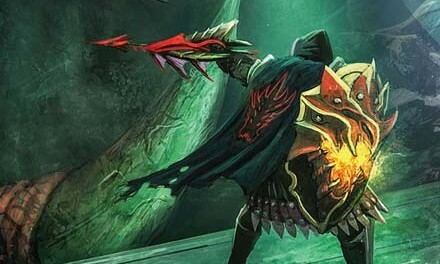 This works in a similar way to DTG placement. The folks at Smake have long experience in textile finishing and, coupled with their IT knowledge, have built a solid workflow- tracking system. Each step along the way, Smake tracks and controls the process. Mistakes are prevented and the process is highly interactive. Smake is available in ten languages and supports twenty-four currencies. Last year SAATI turned some heads with its high-resolution direct laser image and exposure unit, the LTS 6080. What made that extremely interesting is the one-piece flow system where the laser images and exposes the screen simultaneously. Zero consumables. So, what do you do when you had the mic drop from last year? You improve it and make it larger, and give it some more features. While the previous version could handle screens up to 25” x 36”, the new LTS 1015 has a maximum image size of 53” x 65”. The laser power has also been increased, from 96 laser arrays to 160. The speed is based on which one of the five resolutions you want to use: 2540, 1693, 1270, 1016, or 847dpi. The higher the resolution, the longer it will take to complete the process. But here’s the real kicker: now you can image and expose two 25” x 36” screens simultaneously. And it has enough power for high-density capillary film too. For high volume shops that churn through a massive amount of screens each day, this might be just the right tool. is because that type of look isn’t a solid colour. I really liked the Striped Hooded Sweatshirt (SF77R) as that pattern could set off some great design work. My designer brain was already imagining what I could place there for clients. The garment is very soft, and at 7.2oz of preshrunk 50/50 cotton and polyester, it is decoration-ready. It comes in four colours: midnight stripe, denim stripe, fire brick stripe and grey stripe. There is a tech pocket for gadgets, and it also has a tearaway label. Many shops are making the switch to water-based ink, and Matsui has recognised the need to easily mix its inks to match Pantone or custom design colours. To achieve this goal, they partnered with Corob, an Italian company known for manufacturing mixing systems worldwide. The result is the Shinobi Lab, which is a small but powerful mixing system designed for Matsui’s line of water-based inks for the decorated apparel industry. The system is easy to use and will reduce the need to have a key person that has an eye for mixing. Now, anyone in the shop can do it by using their system and pressing a button. How the system works is that the user adds specific grams of base and pigments to a container based on the amounts needed to produce a particular colour. Everything is recorded in the system. You can make small or large quantities of ink, and even custom blends. What I liked was that during a demonstration, the person talking through things started off with a few hundred grams more of the base than they really needed. Instead of scooping out the overage, the system could adjust for the new weight and calculated the new amounts of pigments needed to make the right colour. 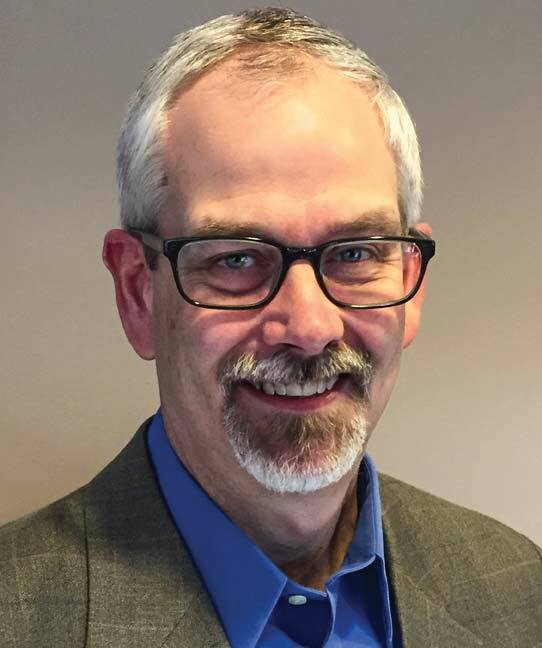 It’s no secret that PolyOne has a big footprint globally when it comes to selling ink. 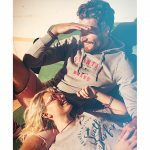 To further that point, they combined the industry knowledge and wisdom of Wilflex, Rutland, Union, Printop and QCM brands to develop a new line of ink for the decorated apparel industry. 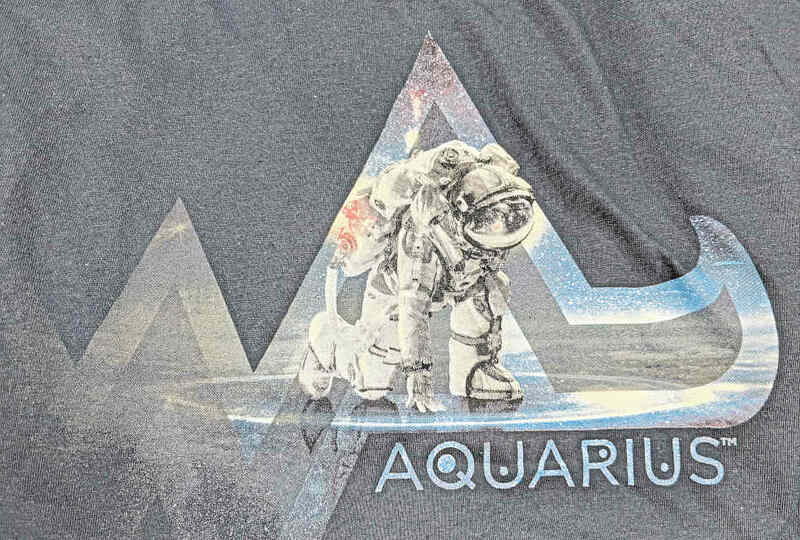 PolyOne‘s new range of Aquarius water- based screen printing inks, part of the Zodiac collection, has been designed for consumer sustainability demands, but without compromising the performance and durability expectations of the printer. It is a full package system with 15 pigment concentrates, CMYK inks, bases, high solids, special effects, discharge (including non-formaldehyde) and even ink that is designed to print on high mesh counts. 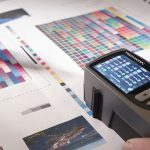 It was built to provide very soft prints while meeting stringent compliance and regulatory requirements. 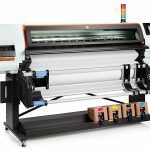 In its now traditional corner of ISS Long Beach, Ryonet created and sustained a lot of buzz surrounding the new launch of the RoqPrint Now, an inline hybrid press. It was obvious from the start of the show that there was something special going on in the Roq and Ryonet booth. Visitors from all over the globe set out specifically to see this new technology in action, and Roq delivered. This new press had a lot of people talking. In a nutshell, this is a direct-to-garment press built on a traditional screen printing press frame (and screen printing stations can be added in as well). Shirts are loaded, pretreated, flash cured, printed and flashed again… before the garment is off-loaded to a dryer belt. This is all in one step, and the benefit of this process is that the dryer belt does not have to be reduced in speed too much to accommodate the water-based ink like other DTG presses. 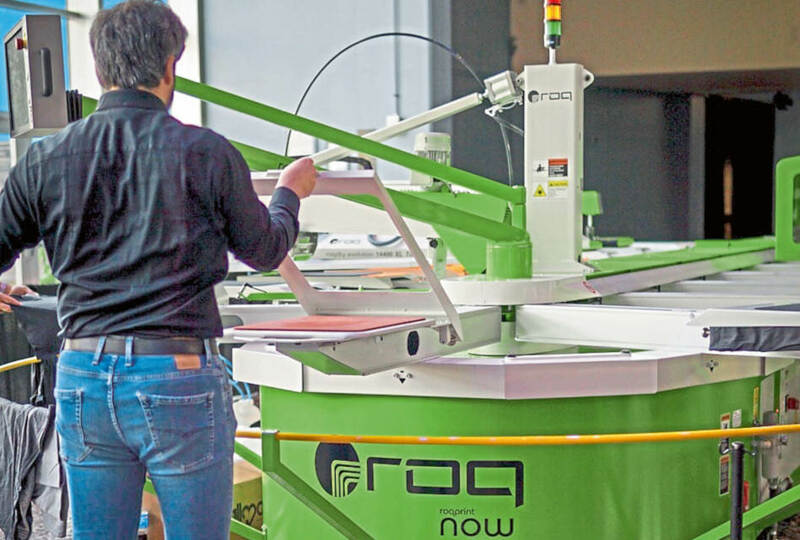 With the RoqPrint Now, there is a solid web-to-market solution for one-off production runs that are capable of delivering production rates between 100- 200 per hour. If there are larger quantity runs, the press is capable of speeds of over 400 impressions per hour. 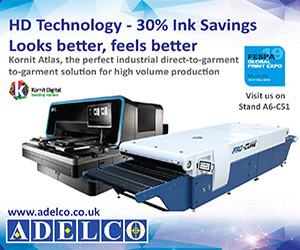 Offering an in-line pre-treatment application and curing solution, a dedicated digital white ink print head and a dedicated digital colour ink print head, the RoqPrint Now allows for faster high quality digital garment printing than ever before with no screens required. 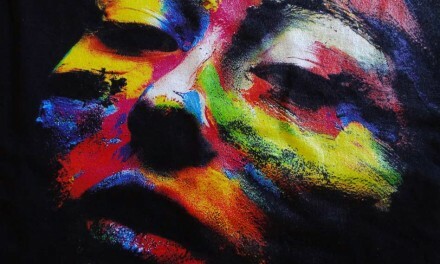 The future of high quality digital garment printing is here, and it’s called RoqPrint Now. Imagine a world where your embroidered design helps with the electronics of your garment! Welcome to the world of Madeira High Conductive Thread. Smart textiles are intelligent textiles, which bring technology and textiles together and where functionality is directly integrated into the garment structure. HC40 and HC12 are skin- friendly, comfortable, biocompatible and washable, and therefore ideal for smart textile applications. Amongst all metals, silver offers the highest electrical and thermal conductivity. In addition, it has antibacterial and antistatic properties. 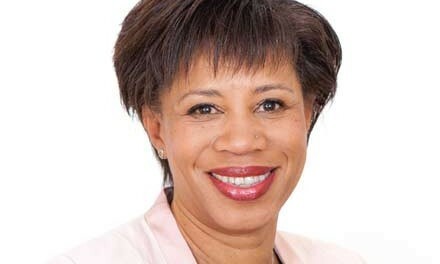 The applications for this could be enormous for the industry. Lighting and LEDs, textile-based sensors and actuators, heating and flexible circuit paths. It’s going to be really fun to see how the decorated apparel industry and other manufacturers use this new product!